The BFIC offers phone counseling services to help foreign residents of Busan with difficulties that they may encounter and to give them any necessary assistance. This counseling service is easy to use for those who are not proficient in Korean since callers can get advice from consultants in their own language. 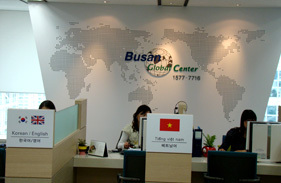 Visitors who come to the Busan Global Center in person may receive one-on-one consultations. In addition, they can get a variety of information on life in Busan and on the wide range of programs offered by the BFIC. Service hours : Mon.-Fri., 9:30 A.M.-6:30 P.M. Experts in each field are helping us to provide more professional consultations. The experts include lawyers, certified labor consultants, judicial scriveners, tax accountants, licensed real estate agents, and customs agents.